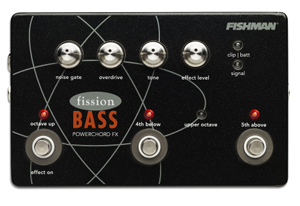 Bass players visiting Summer NAMM 2011 in Nashville didn't find too many earthshaking developments for bass, but the Fission Bass Powerchord FX Pedal from Fishman may have metal bassists turning their banging heads. The Powerchord lets bassists lay down beds of power by adding stacked harmonies over their bass lines. Through an intuitive set of controls and footswitches, several combinations of octaves, 4th and 5th above the root note combine to produce powerchords or octave-up effects. The four footswitch LEDs give you visible indication of the selected harmony. When the effect is off, the LEDs dim making it easy to set up a harmony before you kick on the chord. It’s also a multi-effect pedal with up to 3 voices of harmony, adjustable noise gate, overdrive, tone and effect level. This power-effect combo gives you creative control over anything from subtle octaves to thick, grinding effects that even your guitar player will envy. Housed in a lightweight, yet sturdy metal enclosure, Fission Bass uses state-of-the-art 32-bit signal processing and 24-bit audio conversion. Its monophonic input accepts a wide range of pickups. The mix output is perfect for single amp operation and an effect-only output for feeding a dedicated guitar amp. Fishman procues fine pickups and preamps, so we expect the Powerchord to be well amde and durable. MSRP: $430.69 USD; Street price: Around $270 from several online stores. Single 1/4 inch input with trim control accepts active or passive instruments.